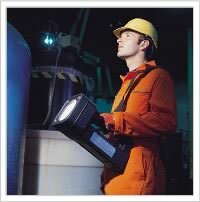 THE TOPLITE T3 SEARCHLIGHT IS A POWERFUL, FULLY PORTABLE LIGHT SOURCE APPROVED FOR USE IN ZONES 1 AND 2 HAZARDOUS AREAS AND IS IDEAL FOR USE IN INSPECTION, MAINTENANCE, SECURITY AND RESCUE/RECOVERY APPLICATIONS, IN POTENTIALLY EXPLOSIVE GAS ATMOSPHERES. Advanced design and quality components ensure a long life for the Toplite, even in heavy industrial use. The Toplite casing is lightweight and durable, made from anti-static polyethylene polymer to withstand drop and impact even at sub zero temperatures. Ergonomic design ensures easy operation with gloved hands; and allows single handed full power/off/low power selection. Ingress protection of IP67 for use in excessively wet conditions, and if dropped in water it will float, beam upwards, for easy location. The light source is a glass sealed beam unit, protected by a toughened glass lens. The TL-9050T3 spotlight has a 50 watt halogen lamp, providing a 160,000 candle power spot beam of intense white light, ideal for long distance illumination. The TL-9055T3 floodlight has a 35 watt trapezoidal flood beam, providing a wide angle of illumination over a localised area, perfect for maintenance operations in hazardous areas. High power on the Toplite TL-9050T3 lasts for approximately 70 minutes, low power for up to 130 minutes. On the TL-9055T3, high power lasts approximately 100 minutes, low power lasts for up to 190 minutes. The recharge time for a fully discharged battery is 16 hours. An electronic microprocessor control circuit manages the operation and charging of the lamp, with multi-coloured state of charge indicator which displays battery capacity (charge and discharge modes), a low voltage cut-off device which automatically switches off the lamp at end of discharge, and a ‘walk-out mode’ which warns when low voltage cut-off approaches by automatically switching the beam to low power output and pulsing off once every 15 seconds. 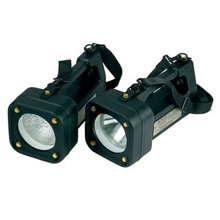 It is also equipped with a power failure illumination facility which is selectable by the user.